Bali is a beautiful place, but one of the drawbacks of beautiful places is that it's hard to consume all of the beauty at once. 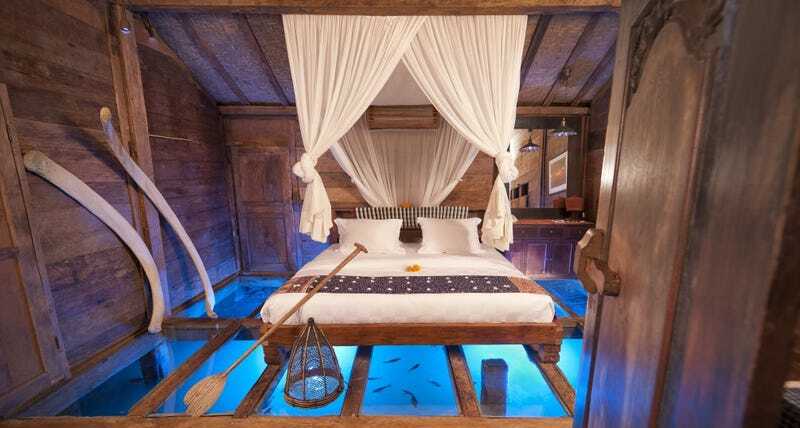 That's why the Bambu Inda Hotel built a glass-bottomed hotel room on top of a fish-filled pond. It's supposed to create a "fishing village experience." They must have some pretty divine fishing villages in Bali. The eco-friendly Bambu Inda Hotel is composed of over a dozen century-old Javanese bridal houses, hand-carved by local Indonesian artisans. (The hotel owners are both from North America.) The houses are nestled in between scenic rice paddies near the town Ubud and Mount Batu Kau, a volcano. The Udang House—which literally means "Shrimp House"—must be a popular choice with rates starting at just $195. Not only does its glass bottom give you a glimpse of the marine life beneath, it also features a glass-ceilinged bathroom with an open-air shower. The house is decorated with fisherman-friendly wares, like giant whale bones and antique shrimp baskets. If you're not so much into the aquarium experience, the hotel features plenty of other surprisingly affordable options. You can try your luck with the Kolam House, a quaint little cottage surrounded by a moat and accessible only by stepping stones. Or go for the royal treatment in the Jawa Lama House, an extra spacious home with views of the Sayan Ridge. If you're going all the way to Bali, you might consider splurging at getting the four-story Pagoda.